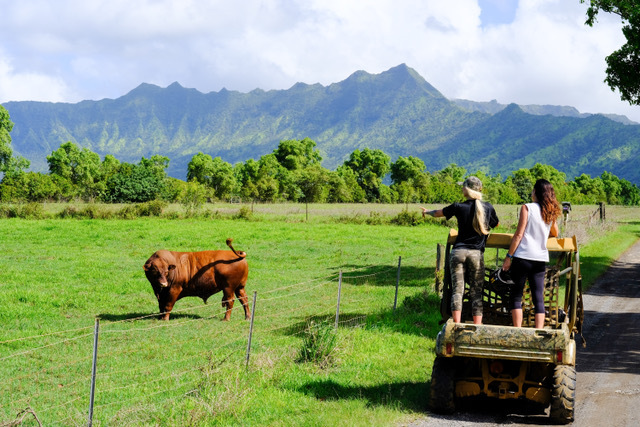 Princeville Ranch is a 2,500-acre authentic cattle ranch, family owned and operated since 1978. 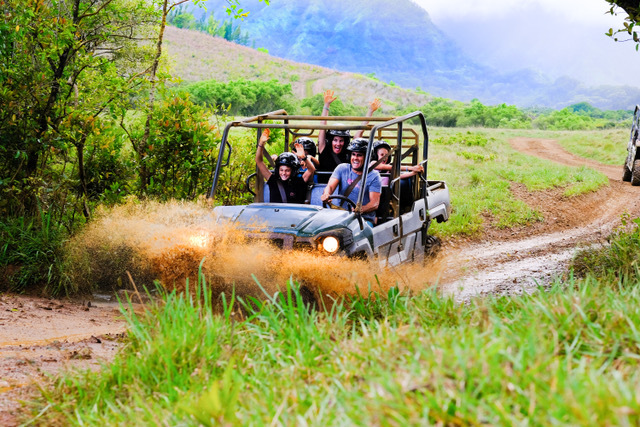 Princeville Ranch offers a variety of eco tours including zipline tours, horseback, off-road, hiking, and kayaking tours. They have several waterfalls on the ranch and the combo tours are perfect for the whole family. The guides are fun and knowledgable and will show you an amazingly great time! 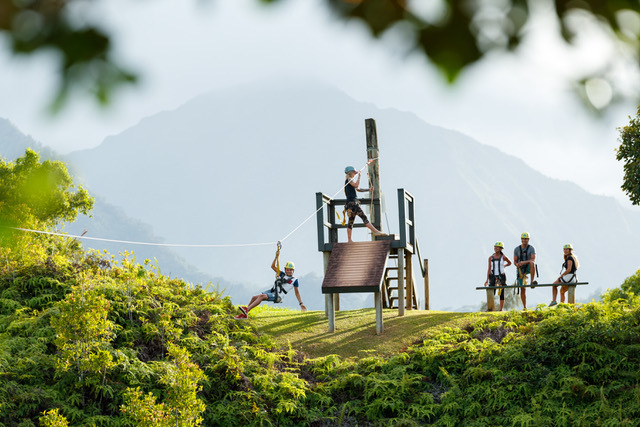 The most popular tour is an exciting Kauai zipline adventure on the pristine private lands of Princeville Ranch! The course is a thrilling combination of nine picturesque zip lines and a suspension bridge spanning a waterfall. Imagine walking off the edge of a lush valley, flying over tree tops across to the other side, soaking in the gorgeous mountain views along the way. The final zipline — called “King Kong” — is an adventure all on its own! First you walk up a ramp to a 26-foot high tower. Next you zip 1,200 feet, racing your partner side-by-side or maybe holding hands! The tour includes an hour at a fifteen-foot deep, hidden swimming hole, fed by a small waterfall. Here you’ll enjoy a delicious picnic, swimming, jumping and floating on inner tubes. Hiking is rated moderate and is just over one mile. The waterfall horseback ride is the longest running tour and is more than a trail ride – it’s an adventure! Imagine being surrounded by breathtaking views and then hiking a short, steep trail through a rainforest to an 80-foot waterfall. It’s an exhilarating experience, for both first-time and advanced riders! Check out the "Ride n Glide," a unique adventure combining a ride with the thrill of three fun, fast ziplines! Inquire about exclusive private rides. 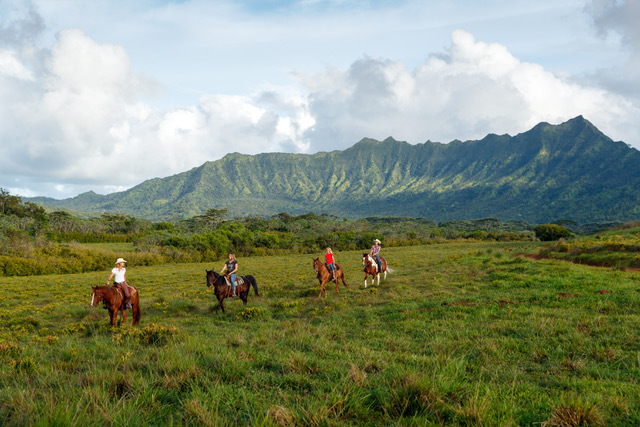 Whether you’re a first time rider or true equestrian, Princeville Ranch has the private ride for you! Horsemanship lessons are also available. The adventure begins where the pavement ends! Start off with an exhilarating off-road experience on the private ranch and hike to a beautiful waterfall for a swim and a snack. You’ll drive side-by-side Kawasaki and Yamaha 4x4 vehicles to nooks and crannies that have never been accessible before. There are plenty of exciting dips, turns and climbs as you roll through pastures and forests on our beautiful 2500 acre ranch. Your first special destination? One of the most panoramic sites on the North Shore. Here, you’ll enjoy a stunning 360-degree view of the entire North Shore with the Hanalei mountains and the deep blue Pacific Ocean surrounding you. Once you catch your breat,h you will jump back into your rigs and drive to the next destination for a hike through the rainforest that takes you to an interior valley opening up to a secluded twin waterfall. Swim, jump and splash in the falls, or maybe just relax and float in an inner tube. Meanwhile, your guides will lay out a delicious snack. Cap off your adventure with one final exciting ride back across our working cattle ranch. Fun, fast, and an exhilarating way to spend your day! Enjoy beautiful Hanalei mountain views as you approach the secluded Kalihiwai Stream. The Kauai kayak adventures takes you through a serene rainforest valley steeped in tropical sounds, scents and sights. Tie up your kayak and hike deeper into the ranch, negotiate several stream crossings and arrive at the spectacular Uluhe Fern Ridge. Here guests 50 to 280 pounds have the option to ride our two magnificent 400+ foot zip lines and connecting bridge over a pristine twin waterfall and swimming hole. Ziplining Kauai doesn’t get any better than this! After your Kauai zipline adventure, you can swim, jump, float on inner tubes and enjoy a delicious picnic by a beautiful waterfall. This heavenly private swimming hole is all yours! When all “pau” (finished) it’s a hike and kayak back to wrap up this popular family adventure.